I am finally getting into my studio after the flu and other maladies that have effected me for the past month. 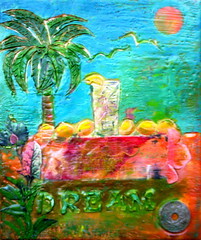 I am dreaming of the tropics, of warmth and sun, and sweet lemonade. Its dreary here today, but I have a week off work for spring break and I am feeling better and am as happy as if I was in the tropics. 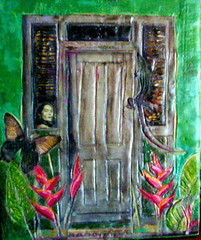 This encaustic is really an expression of my own inner child ...with memories of looking out the window at all the kids playing down below our third floor apartment window in Chicago, and me dreaming of being down their playing with everyone. I find this one so very evocative of the magical inner child. 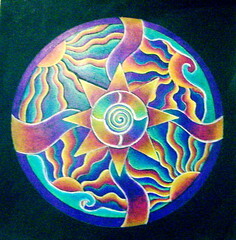 I have finally finished my New years mandala that I began at the last Illuminated Mandala workshop that Patricia and I facilitated in early January. I have an earlier post about it. I put this aside and then recently began working on it again....during a long, long bout of the flu. We will be doing a Spring Retreat soon, on March 22nd. If you are in California and interested.....then why not check my website, http://www.creativeartstudio.com for more information. "Are There Trees Near You and does your own Soul need Comforting?" with his red-brown feathers all trim and neat for the new year. First, I stood still and thought of nothing. And, of course, yes, so it seemed so was I. Its like one of those magical places wise people like to talk about. once you've been there, your there forever. the song may already be drifting away.